Sen. Barack Obama (D-IL) With just two years in the Senate and few legislative accomplishments under his belt, Barack Obama's strength is his speaking style and his ability to connect with his listeners. 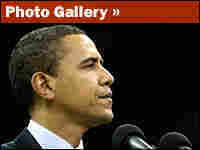 Barack Obama's first appearance on the national stage came in 2004, when he awed Democrats at the party's national convention in Boston. At the time, he was the Democratic nominee for an open Senate seat in Illinois — an improbable nominee, at that. Obama declared himself "part of the larger American story" and said "in no other country on Earth is my story even possible." His story is, indeed, compelling: His white mother grew up in Kansas, his black father in a village in Kenya; they met and married in Hawaii. Obama became a community organizer and, later, a state legislator in racially divided Chicago. His victory in the 2004 Democratic Senate primary was considered a major upset. Only two years before, he challenged Rep. Bobby Rush (D-IL) in the Democratic primary and got clobbered. But when Obama spoke at the 2004 convention, many Democrats inside the hall and those watching on television saw Obama as the party's future. Few, however, expected that future to come this fast. Since announcing his candidacy, Obama has given Democratic audiences the sense that he can rise above politics (and even race) and inspire hope. He has drawn huge crowds to his rallies. 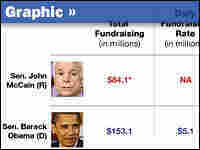 He has further cemented his standing as a viable candidate with his prodigious fundraising prowess. That his campaign kitty is comparable to Hillary Clinton's is especially impressive, considering the fact that the Clintons have been raising money for nearly two decades, while this is the first time on the national scene for Obama. One criticism Obama has faced is his comparatively thin elections resume; he is running for president having spent just two years in the Senate. He responds to that by saying that he has not picked up the bad habits of people who have been in Washington too long. And he points out that in 2002, while still a state legislator, he was publicly speaking out against invading Iraq at a time when Sens. Hillary Clinton, Chris Dodd, Joe Biden and then-Sen. John Edwards all voted to give President Bush the authorization to go to war. Those senators are now his rivals for the 2008 Democratic presidential nomination; all are now against the war. Obama has been heralded widely as a "rock star." But as Howard Dean learned in 2003-04, early hype about a candidacy can certainly fade. Obama's staff has wisely managed to tamp down expectations of their candidate. But the nation has never had a serious African-American presidential candidate before, and the question of whether voters are ready to vote for one is not likely to be answered until the primaries and caucuses begin in January 2008.